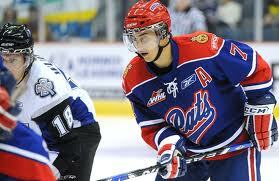 Will Jordan Eberle, formerly of the Regina Pats, win the Calder Trophy? I think so. I'm usually not one for predictions since, well, I've got a terrible track record. Just look at my Memorial Cup picks from last season. I went 1-for-4. Yikes. Similarly, I was rocked in this year's March Madness. But when J.P. Hoornstra, my editor at HockeyPrimeTime.com, asked me to chime in with my picks for the 2010-11 National Hockey League season, well, how could I say no? You can see all of the picks from the HPT.com staff right here. It's interesting to see that none of us agree on everything, although we come close to a consensus on a few select issues, like Alex Ovechkin winning the Rocket Richard Trophy or the Washington Capitals winning the Eastern Conference championship. There are also some picks where I stand alone, like tabbing Tuuka Rask to win the Vezina or Jordan Eberle to go home with the Calder. But hey, there's the distinct possibility that we'll all be wrong. That's why you play the games. But anyway, I figure that I'd share all of my picks right here so that you, the fan, can mock my poor decisions in about nine months time. Agree? Disagree? Want an explanation? Go ahead and ask, I'll be happy to answer.